One of our major goals is to develop Idea of America value-based programs for high school students in after-school programs, ideally where students will receive credit in their high schools. These extended learning programs will be designed to embrace local community volunteers as well. It is our belief that history and civics can be effectively taught and experienced through such programs which can be far more creative and innovative in both engaging students and local community volunteers than the traditional curriculums now being offered in our educational systems. But our programs are being developed as supplemental to traditional curriculums, not replacement. We will seek to identify existing programs with which we can partner, and currently have such a program that has been operating since 1998 in Belfast, Maine. It is officially registered as the Maine Youth Alliance, but is better known as "The Game Loft." We are now working with The Game Loft to develop an Idea of America values-based program in their "Coming of Age in America" program. Once developed, we will offer this program to participants in our adult seminar program as a means to become more actively engaged in their local community to advance our goals. We are developing three major support resources: (1) A "How-to-do-it" manual that will lay out the necessary action steps for initiating a local Coming of Age in America educational program; (2) A video of an actual program conducted in Belfast for promotional use; and (3) Expert support and consultation with the Coming of Age team. In a small but seasoned program in Maine there is a way of learning history by being history. Small groups of students, in an after-school program, become embedded in a year-long role play and game theory narrative of an era in American history. This one is of the decade leading to the American Civil War. Last year it was the era of the American Revolution. It all takes place in an imaginary county in an historically accurate setting. This rooted, really existential, learning of history is as different as being in a play is from reading the manuscript. In this program, values-in-conflict are defined and developed just as they are in real life for us now. We don't know where our history is taking us, but we do know that values are at stake and we know how the past has interpreted those values before. This experience with our values-in-tension has a face and a narrative before they have an abstract definition. One of the basic assumption in the Idea of America curriculum is that America is a work in progress where democracy requires participation and compromises as well as values and virtues. In teaching the program to adults I have seen them "get" the idea that we as a country have been confronting issues and challenges and have had to sort out the meaning of our values as a nation. It is reassuring when we see that history has been here before. But with these young students it is not only history that has been here before, they themselves in existential ways have been here before as well. The Coming of Age in America program uses role-play and experiential learning in small groups to explore concepts in U.S. history, Maine history, civic-involvement, and ethical decision making. The program is designed to serve students at risk for dropping out of high school. It offers a high level of social interaction and opportunities for improving speaking and listening skills. The program is designed to be used to supplement the classroom experience in a non-school setting. Students analyze and criticize varying interpretations of historic people, issues and events. Students analyze the constitutional principles and the roles of the citizen and the government in major laws or cases. Students understand political and civic aspects of unity and diversity in Maine and the United States. Students make simulated decisions related to Maine or U.S. by applying appropriate or relevant social studies knowledge and skills including ethical and reasoning skills. Students develop individual and collaborative decisions and plans by considering multiple points of view, weighing pros and cons, building on the ideas of others, and sharing information. 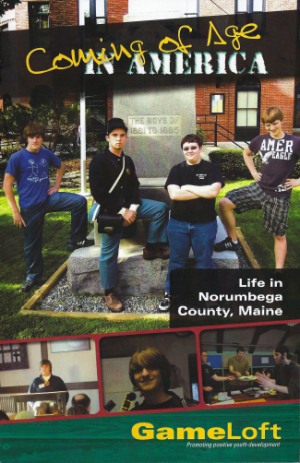 The Coming of Age Program has been operating in Belfast, Maine since 2006 and has been widely recognized for its innovative approach to teaching values, history and civics especially targeted to low income or high risk youth. It is now partnered with the Idea of America Network in building into the program the value-based model developed by Idea of America. The goal is to serve as a community based civic-engaged model for other communities to consider offering, building on their own local history as well as our nation's history.